We hear it a lot, and unfortunately, the “punchline” is often not funny at all. All the old adages hold true- “an ounce of prevention is worth a pound of cure”, “you can pay me now, or pay me (a lot more) later”…In other words, the best time to evaluate your legal rights, responsibilities and potential liability is before you sign on the dotted line. And, by no means let the person on the other side of your transaction (or their broker/agent) convince you a lawyer is not necessary. Odds are they will be little help to you if/when something goes wrong in the deal later on. The following presents a real life example that happens all too often in the residential real estate arena. A buyer of a parcel of real estate (improved with a house and other improvements thereon) is presented with a broker form contract from the seller’s agent. The buyer asks, “Do I need a lawyer?” The answer given is, “No, they’ll just add time (theirs) and money (yours) to the equation. Anyway, the contract forms were drafted by lawyers. It is your choice, of course, but if you take all that extra time, you’ll probably lose the deal. There are a lot of interested buyers”. So, buyer signs, without having a lawyer look over the contract. During the two months prior to Closing, things seem to go well; the inspections don’t reveal any problems and buyer’s financing goes through…Then, on the day of closing there is a stack of forms to sign; “all routine” according to the broker and the banker. Finally, about two weeks after closing, the buyer gets a package of documents from the title company including the deed and title insurance policy. The buyer then puts the documents in his safe, thinking he is. The trouble begins about six (6) months later. The neighbor writes the buyer a letter (with a copy of a survey) showing that some of buyer’s landscaping, retaining wall and driveway gate encroach upon the neighbor’s property, and demanding that buyer remove those items or the neighbor will sue. The buyer thinks the neighbor is crazy, but asks us to review everything. The buyer says this should be “a no brainer” because he has a survey, title insurance… everything he was advised to get when he bought the property. Suffice to say, thing are not always what they seem. The buyer did get a survey, but not because the broker form called for a survey. Most broker forms do not contain survey provisions. Since the buyer got a loan, the bank ordered a “Mortgage Location Survey”. The Mortgage Location Survey, however, did not show the landscaping, retaining wall (barely visible within the landscaping) or driveway gate. Mortgage Location Surveys in Ohio (and elsewhere) typically just show that the building(s) and/or other permanent improvements of the property are actually located on the land covered by the legal description in the mortgage. 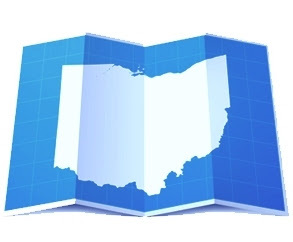 Pursuant to Ohio law (Ohio Administrative Code Section 4733-38), there are minimum standards for a Mortgage Location Survey, but most of the same just require the surveyor to show: the boundary lines as cited in the legal description; major improvements (permanent structures; e.g., residence, garages, outbuildings with foundation); any visible utilities; apparent encroachments and the address posted on the building(s). Our buyer’s landscaping, wall and gate were not deemed permanent structures and were not apparent to the buyer’s surveyor. • Easements benefitting or encumbering a property. • Encroachments across the boundary or easement. • Whether or not there is access to a public road. • Flood zones that may impact the property. • Evidence of any use by other parties. • Water boundaries within the property. • The names of the owners of the adjoining property. The ALTA/ASCM survey is also held to very strict standards of accuracy. The allowable error in linear feet for urban property is approximately 1 foot in just less than 3 miles. In other words, for every 15,000 feet the survey can only be off by as much as 1 foot. An equally important reason our buyer should have gone with an ALTA/ASCM survey is that the title insurance company would have (if asked) deleted its standard exception for survey matters. Many buyers don’t concern themselves with the “provisos” of title insurance, and believe that if they are getting a title insurance policy before closing, they are protected. They will be protected, but not from survey encroachments and other matters unless they request such protection, and have an ALTA/ASCM performed. Sometimes, in smaller residential deals the title company will even waive its survey exception with a Mortgage Location Survey. All you have to do is ask. With the survey exception deleted, all our buyer would need to do is send the neighbor’s letter to the title company. The title company’s lawyers would then work out a deal with the neighbor, and our buyer wouldn’t need to spend a dime. Most broker form contracts, by the way do contain provisions for title insurance (to be provided at closing), but few include the right to receive a title commitment, prior to closing. To ensure that buyers get “good, marketable title” to property, as well as enough time to make that determination, buyers should insist upon (in the purchase agreement) a “title commitment” being delivered within a short time after signing the contract. The “title commitment” is a contract by the insurance company to enter into an insurance contract with the buyer, whereby the title insurance company will guarantee good title, subject to exceptions it finds upon a title search of the property (e.g., easements and liens having been filed against the property). If buyers have an early chance to review these items (via a title commitment), they can evaluate whether or not same will adversely affect the property they are purchasing, and exercise a right to terminate the contract if there are items that will adversely affect the buyer’s use or value of the property. While a title commitment (and corresponding right to terminate if the commitment shows liens, defects…) would not have helped the buyer on our facts, it will prevent many buyers from being unpleasantly surprised after they close with easements and other recorded rights against their property. So, to recap, the buyer in our fact pattern has a survey, but is shows no encroachments. Our buyer has title insurance, but no coverage for survey matters. Our buyer is essentially out of luck. While there may be an action against the surveyor, proving “apparent encroachments” of “permanent improvements” could end up costing more in legal fees than removing the encroachments. Can the buyer at least sue the seller? Sure, but in our fact pattern, the seller would probably prevail as it had a very common clause put in its deed (i.e., “subject to facts an accurate survey would disclose”). What’s the moral of the story for buyers of real estate (residential and commercial)? Have a real estate lawyer draft or review your contract, BEFORE you sign it, to ensure that you have: (1) the right to receive/procure a title commitment and survey, (2) the right to have the title insurance standard exceptions removed, (3) the right to review and object to adverse title/survey matters, (4) deed language that won’t effectively prevent an action against the seller; and (5) the right to terminate the contract if the seller won’t cure survey or title matters that adversely affect the use or value of the property you are buying. Also, if your title company will not remove the survey exception without an ALTA/ASCM survey, make sure you procure the same. Further, for an additional premium, residential buyers can get even more protection with the ALTA Homeowner’s Policy. The ALTA Homeowner’s Policy (vs. the “Owner’s Policy”) provides coverage against losses from zoning violations, subdivision law violations, improvements that encroach into an easement, building permit violations, violations of covenants, conditions and restrictions, lack of vehicular and pedestrian access, supplemental assessments arising as a result of construction or transfer prior to the policy date and damage to the home caused by someone with easement rights. A few extra “ounces of prevention” will always be worth the “pounds of cure”. What exactly would you use a real estate lawyer for? Is it just if you're doing a law suit and need a proof of contract? I'm going to be buying a property shortly and just want it done the right way.